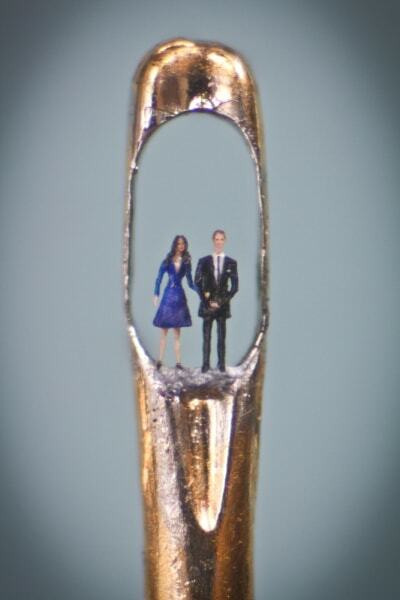 The latest work by micro-sculpture artist Willard Wigan, showing Britain's Prince William and Kate Middleton in an eye of a needle. The work is on display at Castle Gallery at the International Convention Centre in Birmingham. Wigan, an artist celebrated for his tiny creations, fashioned the piece, which can only be viewed through a microscope, from synthetic fibre and painted it using a single eyelash. The artist Willard Wigan told the BBC he wanted to create "the smallest, biggest tribute" to the royal couple for their wedding day. You can see more of Wigan's micro-sculptures on his website.